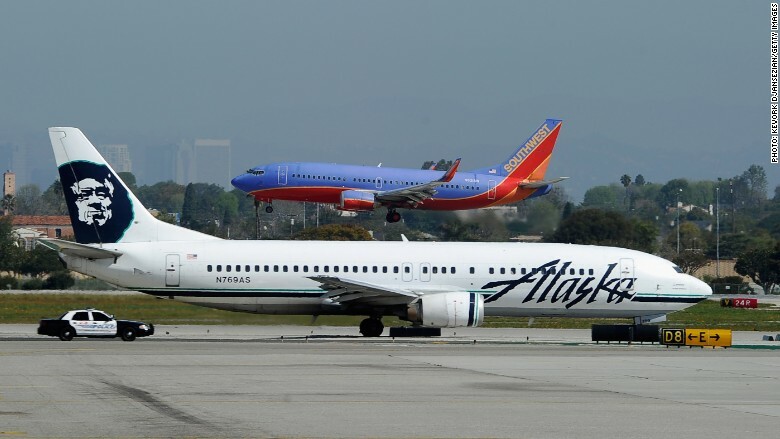 Alaska Air (ALK) carried paying passengers on two flights Tuesday using a mix of jet fuel and a biofuel made from corn. The airline said the flights were the first ever to use fuel based on alcohol made from fermented corn. Both departed from Seattle -- one flew to San Francisco, the other to Washington D.C. The biofuel was developed by Colorado-based Gevo (GEVO). The production process is similar to that used to make ethanol -- the type of alcohol used in alcoholic beverages. Gevo said it buys field corn directly from farmers in South Dakota. It separates the nutritional protein for animal feed and then converts the starch to isobutanol, a kind of alcohol that is then converted to jet fuel. Jet fuel derived from isobutanol was only approved for use on commercial flights by U.S. regulators in March. Other aviation biofuels have been tested before. The first commercial flight powered by a mixture of conventional fuel and biofuel took place in 2011. But airlines have been reluctant to adopt alternative fuels because they're expensive. At the same time, the price of oil has been falling, making conventional fuels cheaper for the carriers. "Gevo's jet fuel product is an important step forward, in that it has the potential to be scalable and cost effective, without sacrificing performance," said Joseph Sprague, Alaska Airlines' senior vice president.